Studying history at UCL gives you opportunities to explore the subject which are unrivalled anywhere else in the UK or Europe. 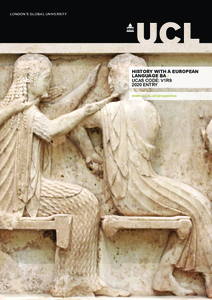 This four-year flexible degree programme introduces you to anglophone and continental European traditions in academic history as well as to an ambitious range of themes, geographical areas and chronological periods. You will spend your third year studying at a European university, where teaching is conducted in another language. History and a European language required. A score of 18 points in three higher level subjects including grade 6 in History and a European language, with no score lower than 5. A score of 16 points in three higher level subject including grade 6 in History plus a European langauge required, no score lower than 5. AAA at Advanced Highers (or AA at Advanced Higher and AAA at Higher), including History and a European Language at Advanced Higher. Successful completion of the WBQ Advanced Skills Challenge Certificate plus 2 GCE A-Levels at grades AAA, including History and a European Language. Gain the experience of living and studying in another European country. In recent years countries have included France (Paris, the Sorbonne), Germany (Berlin, Humboldt Universität), Spain (Seville) and Italy (Venice, Università Ca' Foscari). Develop a high level of linguistic competence, through the compulsory language requirement at UCL and through studying at a university on the continent that teaches in the applicable European language. The programme includes three first-year core modules, a further core module and a research project in the second year, at least nine months studying at a foreign institution in the third year, a final-year special subject, and options chosen from a range of full-year and half-year modules. You will take 30 credits of language modules in each of the first two years to prepare for the year abroad. We strongly encourage all our students to gain maximum benefit from the chronological range of expertise in the department by taking at least one course in each of ancient history; medieval or early modern history; and modern history. Students will follow modules over one academic year at another institution in lieu of modules they would have been taking at UCL. Students should not submit an application to study abroad until they have established that the host institution offers modules compatible with the requirements of their UCL degree. No allowances will be made for non-native speakers by our partner institutions, so students must be confident operating in the target language at an advanced level. Students will receive guidance for their year abroad from the History department during the Autumn Term of the second year. Work placements are not offered. We are keen to attract students from a wide range of backgrounds, finding this helps to maintain an intellectually and socially stimulating community. Applicants will normally have studied History; English or a language taken to a higher level is also an advantage; a European language to a higher level is required.